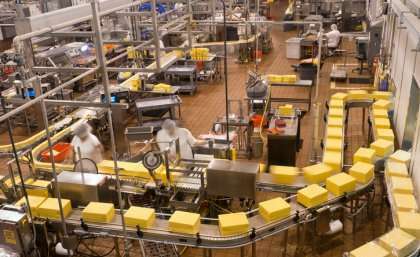 Researchers say their new knowledge on the inner workings of a bacterium has important implications for Australia's billion dollar cheese industry. University of Queensland School of Agriculture and Food Sciences researcher Associate Professor Mark Turner said a discovery by a UQ, Columbia University and University of Washington research group had explained the regulation of an enzyme in the bacterium Lactococcus, which is used as a starter culture in cheese production. "Our research provides new insights into this industrially important food bacterium," Dr Turner said. "Australia produces more than a billion dollars' worth of cheese each year, and Lactococcus is the most commonly used starter culture," Dr Turner said. Two UQ PhD students in Dr Turner's food microbiology research laboratory – Thu Vu and Huong Pham – identified that the enzyme known as pyruvate carboxylase was essential for efficient milk acidification, an important industrial trait in Lactococcus starter cultures. Dr Turner said the enzyme was essential for synthesising the amino acid aspartate, and bacteria defective in the enzyme were unable to produce high levels of lactic acid in milk, which is required for the first stage of cheese making. "Our collaboration also found that a recently discovered small molecule in bacteria, called cyclic-di-AMP, directly binds to and inhibits the pyruvate carboxylase enzyme". "The molecule is essential for growth in a wide range of bacteria, including many human pathogens, and we are only in the early stages of understanding how it controls important processes in bacteria." This project was funded at UQ by an ARC Linkage Project, "Smarter fermentations through starter culture genomics", and co-funded by Dairy Innovation Australia Limited.